In this positional breakdown, I’m looking at five wide receivers at the top of the individual Pro Models that Jonathan Bales, Peter Jennings (CSURAM88), Adam Levitan, Sean Koerner, Chris Raybon, Kevin McClelland (SportsGeek) and I have constructed. UPDATE (11/25): Eagles defensive tackle Timmy Jernigan (back) is in. Linebacker Jordan Hicks (calf) is out after not practicing all week. Cornerbacks Jalen Mills (foot), Sidney Jones (hamstring) and Avonte Maddox (leg) are out. Cornerback Rasul Douglas (knee) is questionable after practicing limitedly on Friday. 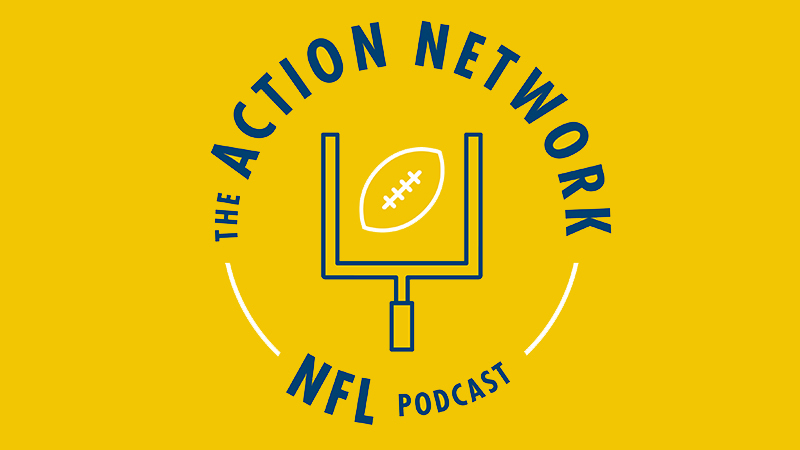 On the Wednesday edition of The Action Network NFL Podcast, we talk about Beckham as a potential pay-up cash-game play this weekend. Beckham had just two touchdowns entering Week 10, then … #Eruption: He has 158 yards and three touchdowns over the past two weeks. Beckham is top-five with a 0.42 market share of air yards, 0.29 target share and 106 targets overall. Even though he’s shackled to latter-day Eli Manning at quarterback, Beckham is still being used in a high-leverage capacity. No NFL wide receiver in history has more receptions, receiving yards or FanDuel points through 57 games than Beckham’s 382, 5,356 and 992.3. We’re talking about a guy who is in his prime, on a Hall-of-Fame trajectory and now facing an Eagles pass defense that has been destroyed by injuries. When OBJ played the Eagles in Week 6, he disappointed with a 6-44-0 performance on 10 targets as the Giants endured a 34-13 loss to their divisional foes. But this Eagles secondary is drastically different than the one he faced six weeks ago. No. 1 cornerback Ronald Darby (knee) is on injured reserve. No. 2 cornerback Jalen Mills (foot) hasn’t played since Week 8. No. 3 cornerback Sidney Jones (hamstring) returned to action in Week 11 after missing Weeks 7-10, but he left the game early after aggravating his injury. Backup corners Rasul Douglas (knee) and Avonte Maddox (knee) are both questionable. Mills, Jones, Douglas and Maddox all missed practice on Wednesday and Thursday. As of this writing, they’re all technically questionable, but it’s likely that all of them will be inactive this weekend. On top of that, middle linebacker Jordan Hicks (calf) is unlikely to play and free safety Rodney McLeod (knee, IR) is out, so the Eagles could be more exploitable than they usually are on crossing routes and deep patterns. Beckham probably has the best matchup of any receiver on the slate. The Eagles have allowed the second-most fantasy points to wide receivers (36.3 FanDuel points per game). As a result, we’re projecting Beckham to have a position-high ownership rate. For guaranteed prize pools, you might want to use our Lineup Builder to stack Beckham with Manning. Since 2014, No. 1 wide receivers on average have had a 0.54 correlation with their quarterbacks. With Manning, Beckham has a 0.69 correlation. On Sunday morning, I might look to bet the over on Beckham’s touchdown prop. He’s second in the league with 14 end-zone targets and fifth with 18 red-zone targets. With a secondary in disarray, the Eagles would be lucky to keep OBJ from scoring a touchdown. To find the best bets in the props market, use our Player Props Tool, which is powered by our industry-leading projections. Since Week 1, the props with a bet quality of 10 have gone 188-89-8, good for a 66% win rate. Beckham has position-high median and ceiling projections on DraftKings, and he’s tied for the position lead with eight Pro Trends on FanDuel, where he’s the No. 1 option in the Bales Model. UPDATE (11/25): Right tackle Marcus Gilbert (knee) is out, and backup right tackle Matt Feiler (pec) is questionable after limited practices on Thursday and Friday. Broncos linebacker Brandon Marshall (knee) is out. Cornerback Bradley Roby (concussion) is questionable. I’ll be honest: Of the expensive wide receivers, Brown is not my favorite this week. The Broncos are fourth against the pass in Football Outsiders’ DVOA, and the Steelers are on the road. He is a great receiver wherever he plays, but Brown has notable home/away splits. Even though Brown has been an All-Pro wide receiver each year since 2014, he’s “struggled” away from Heinz Field. While he has still been serviceable on the road, Brown’s home/away Plus/Minus discrepancy is substantial. It’s hard to pay up for a player when he’s in a situation that has historically and predictably yielded league-average production on a salary-adjusted basis. Additionally, Brown is having something of a mixed campaign. On the one hand, he’s tied for the league lead with 11 touchdowns, and he’s first with 15 end-zone targets. He’s first on the slate with his 109 targets over 10 games. On the other hand, he’s 14th among all players with just 6.2 receptions and 80.7 yards per game. As a four-time All-Pro from 2014 to 2017, Brown had a 68.3% catch rate and 9.3 adjusted yards per attempt (AY/A) when targeted by quarterback Ben Roethlisberger. This season, he has a 56.9% catch rate and 6.6 AY/A on Roethlisberger’s passes. In fact, of any Steelers pass-catcher targeted at least 25 times by Roethlisberger, Brown has been the least efficient with his targets. Given how productive Brown has been, it’s hard to say that he is having a bad year, but through 10 games, it’s a bad year for him. Few people in the industry are talking about Brown’s newfound receiving inefficiency because he’s compensated for it with enhanced touchdown production, but make no mistake: Brown has not been his typical All-Pro self this season. It’s possible that, at the age of 30, he’s starting to slow down. On top of that, in the All-Pro Antonio era, Steelers road games have a 10-27 over/under record, which is good for a 43.3% return on investment for under bettors (per Bet Labs). In fact, the Steelers have been the most profitable road team for under bettors in that time. Not once over that span has the Steelers road under not had a winning season. It’s probable that we shouldn’t expect this game to be a high-scoring affair. Of course, it’s not all doom and gloom for Brown. It’s probable that Broncos cornerback Chris Harris will match up with Smith-Schuster in the slot, giving Brown plenty of opportunity to run routes against cornerbacks Bradley Roby and Tramaine Brock on the outside. And while Denver’s defense is good, it isn’t the intimidating unit of years past. Besides Harris, the Broncos don’t have a cornerback with a Pro Football Focus coverage grade of even 70. It also doesn’t help the Broncos that linebacker Brandon Marshall (knee) is out. In their front seven, he’s the best pass defender. Even with his 2018 slump and tough matchup, Brown leads all wide receivers with his ceiling projection on FanDuel, where he’s tied for the position lead with eight Pro Trends and is the highest-rated wide receiver in the Levitan, Koerner and SportsGeek Models. The Bucs-49ers game has a high pass funnel rating as well as the slate’s highest over/under, which is partially why three Bucs wide receivers stand out in our Models. On top of that, the matchup is pristine. Although the 49ers have cornerback Richard Sherman, who is cementing his Hall-of-Fame case with an age-30 shutdown season after rupturing his Achilles last year, the team is last in the league with a PFF coverage grade of 42.0. Sherman has held receivers to 153 scoreless yards and a catch rate of just 45.8% on 24 targets and 316 coverage snaps. Playing almost exclusively at left corner, Sherman is locking down his side of the field. As a result, targets have been heavily funneled outside of his coverage, and his teammates have been exposed. Safeties Jimmie Ward, Jaquiski Tartt, Adrian Colbert, Antone Exum, D.J. Reed and Tyvis Powell have allowed a 72% completion rate. Against such a defense, Evans, Godwin and Humphries have immense upside. Thanks to their magnificent combination of high-scoring offense (26.7 points per game) and stone-worst defense (32.9 points per game allowed), the Bucs have an 8-2 over/under record this year, which is the best mark in the league for over bettors. I’m betting this game makes it nine. 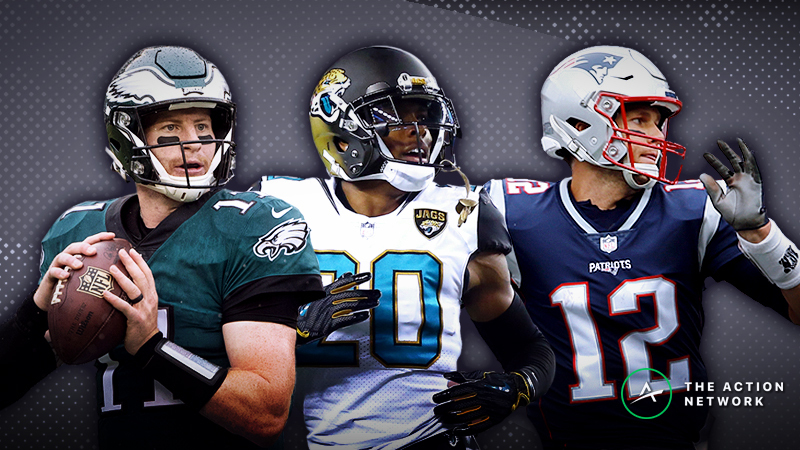 Along with DeSean Jackson, the trio of Evans, Godwin and Humphries is perhaps the league’s best collection of pass-catching talent, which has translated into a productive offense that relies heavily on the passing game. As a team, the Bucs are first with 4,585 scrimmage yards, 3,610 net passing yards and 264 first downs, second with 411 pass attempts, third with 25 receiving touchdowns and fourth with 6.7 yards per play. Of course, the team has also been hamstrung by its issues with turnovers and the constant turnover at the quarterback position. The Bucs are dead last in the league with 23 interceptions, 29 turnovers and a 24.4% turnover rate on a per-drive basis, and this week Jameis Winston will start at quarterback in place of backup-turned-starter-turned-backup-turned-starter-turned-backup Ryan Fitzpatrick. It’s possible that Winston’s insertion into the starting lineup could be good for the offense, but he’s been a significant contributor to the team’s turnover woes with 11 interceptions and five fumbles in just five games, only three of which were starts. Since Winston entered the league in 2015, he’s tied with Blake Bortles for a league-high 55 interceptions — but he’s played in eight fewer games. Historically, Winston hasn’t been as good for Evans as Fitzpatrick has been. Since last season, Evans has exhibited notable quarterback-based splits. While these splits are apparent even in the games with quarterback changes, I’ve removed such games from the sample so the trend may be better seen. Even on a per-attempt basis, Fitz has funneled more production to Evans. Since last year, Evans has 10 receiving touchdowns — five each from Fitz and Winston, but Winston has attempted 197 more passes. But Evans still has upside even without Fitz. He’s just 43 yards away from becoming only the third player in NFL history (along with Randy Moss and A.J. Green) to open his career with five straight 1,000-yard receiving campaigns. He’s top-five in the league with 95.7 receiving yards per game and second overall with 1,333 air yards. Additionally, Evans is on the positive side of his division/non-division splits, which are pretty much the only situational splits he’s had throughout his career. As for Godwin, he’s still splitting time with D-Jax and yet to play 75% of the offensive snaps in any game, but Sacred Victorious is undoubtedly a key contributor to a wide receiver unit that leads the league with 271.7 yards and 55.1 points per game in point-per-reception scoring. A second-year breakout-in-process, Godwin has hit double-digit targets in only one game, but he’s top-five in the league with nine targets inside the 10-yard line. In what could be a high-scoring game, Godwin is highly stackable with Evans. Collectively they have been targeted in the end zone 16 times, but Godwin and Evans have been rostered together in a low percentage of Millionaire Maker lineups. Here’s their shared ownership rates for the past month. Even though both Evans and Godwin are big-play talents popping in our Models, their shared ownership this week could still be less than 1%. Regarding Humphries: The change to Winston might benefit him. Historically, he’s been more productive with Winston than Fitz. First on the team with 279 yards after the catch and second with 373 routes, Humphries has run 82.8% of his routes from the slot, where he’ll match up primarily with Williams, who has allowed a 73.6% catch rate since joining the 49ers last year. Of all the wide receivers Winston has ever targeted at least 20 times in his career, Humphries has been the most efficient at turning attempts into receptions, based on his catch rate. If Winston wants to avoid interceptions and opts for caution in order not to be replaced by Fitz in the middle of the game, he could funnel targets to Humphries in the middle of the field. Evans is the No. 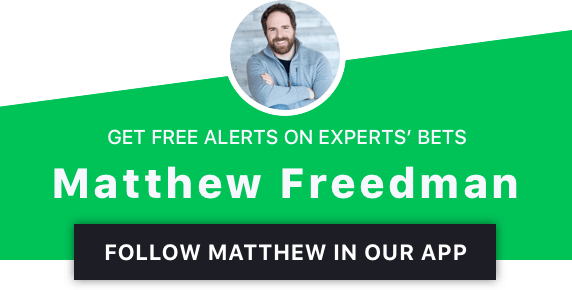 1 FanDuel wide receiver in the Freedman Model. Godwin is the top DraftKings receiving option in the Bales, CSURAM88, SportsGeek and Freedman Models. Humphries is the No. 1 wide receiver on DraftKings in the Levitan and Koerner Models.